In today's world, "dynamic range" (DR) has become, in the minds of (many) photographers one of the main characteristics of a digital camera. Unfortunately, the public data on DR is limited to "DD - ISO sensitivity" graphs and tables. This can be "engineering DR", EDR, like for DxO Mark, meaning that the signal/noise ratio, SNR, is equal to one; or this can be "photographic DR", PDR, like Bill Claff provides here, setting a higher boundary for S/N ratio. With this, the nature of noise (for example, random noise, banding) isn't accounted for, however the noise character is important for visual quality. 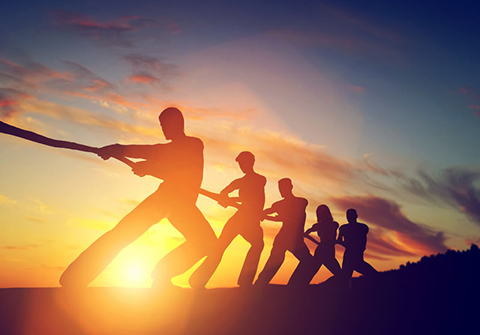 In certain cases, anomalies can be found in DR databases, the interpretation of which requires a somewhat deep understanding of where they came from. Furthermore, measuring DR by the noise in the shadows doesn't account for the possible processing of the signal in the camera. In part, if there is noise reduction or bit depth reduction taking place in the camera, then the level of noise will be (relatively) low, but that very same noise reduction will destroy small low-contrast (and sometimes not so low) details. In reality, any practicing photographer knows that the degradation of the image in the shadows (or because of low exposure) happens gradually, there is no strict demarcating line. It's just that with the lowering of exposure, small details disappear, the contrast between bigger details diminishes, color fidelity becomes worse. 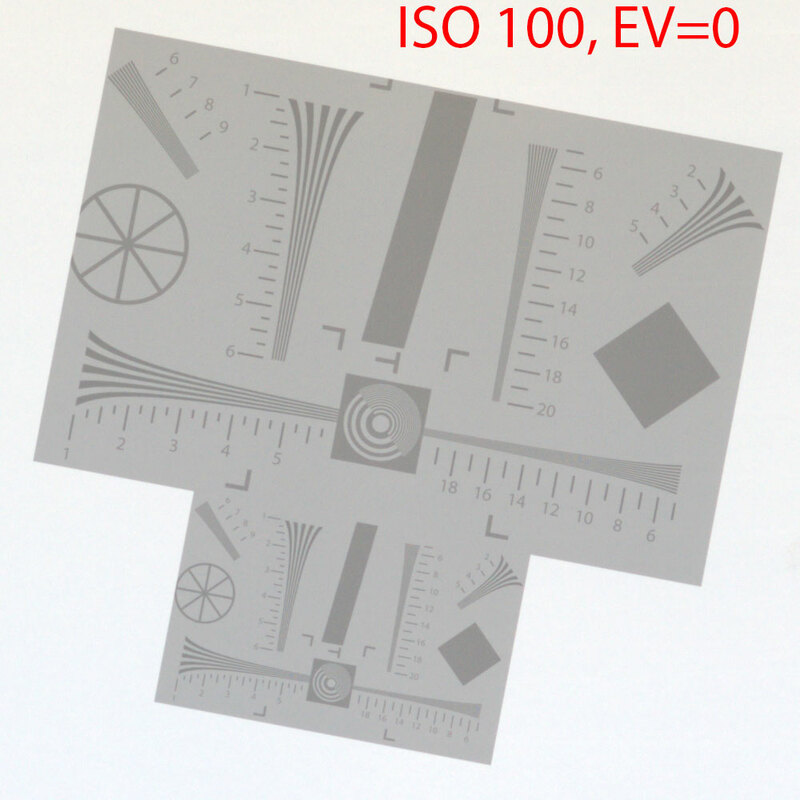 Depending on the quality demanded of the image (which will depend on presentation size, viewing distance, other viewing conditions such as screen resolution, etc.,), the practical dynamic range for the specific camera will be different, even for the same ISO setting. 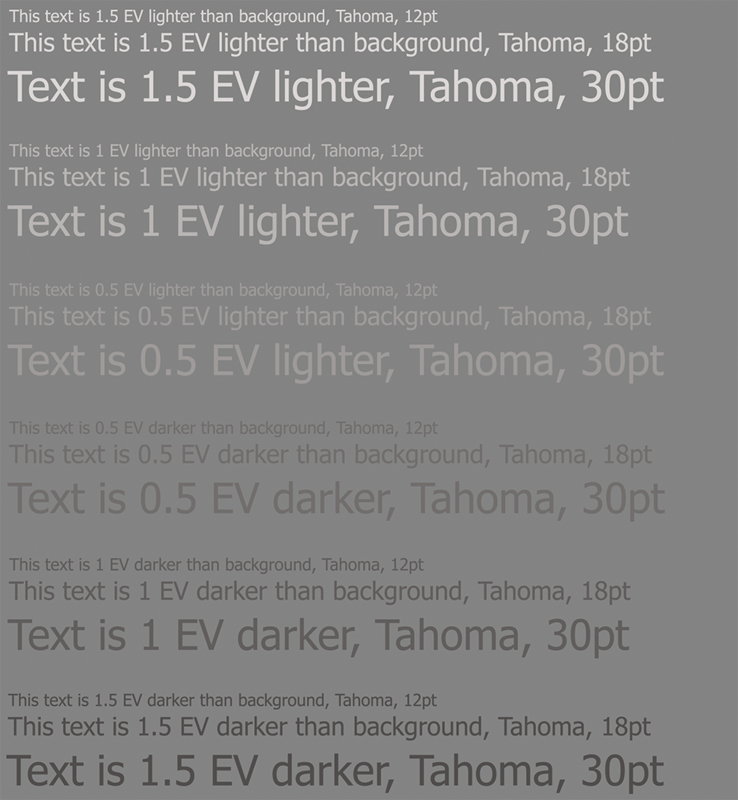 The practical boundary of the dynamic range was set by the legibility of the letters with fixed size and contrast ("12pt with a contrast of 0.5EV is legible" - can be zoomed in, and viewed in large format; "30pt with a contrast of 1.5EV is legible" - can be published online). The real "working DR" data spread was, for EOS 6D and ISO 200 from 7.3 stops by the strictest criteria to 11 stops by the loosest. And how about on a weird tilt, so the clever algorithms that are there to restore horizontal/vertical lines (if the camera has them) break. Here are two resolution targets that differ by a factor of 2 in size, since during the preparation stage it was unclear which size would be optimal (from now on, we will be using the larger, upper target illustration). 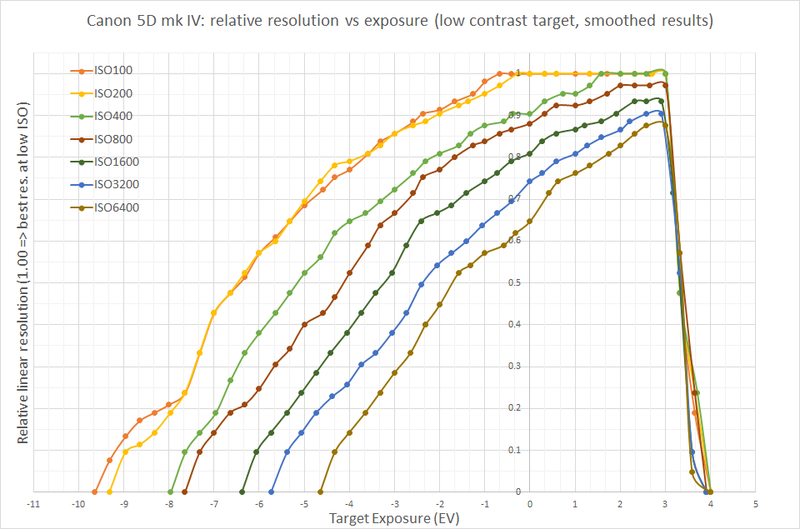 EV = 0 - the exposure that is used is such that the gray background of the target in the RAW was at 12.7% of the clipping level: 3 stops below clipping is the current generally-accepted place for middle gray in RAW, coming from the idea that 2.45 stops (18%) is obviously too little in practice, 4 is a bit too much, and we'd still like to have a nicely rounded value (to get exactly -3 EV, 12.5% should be used, log2(0.125) = -3; however 0.5 EV down from 18% is 12.7%, making it easier to compensate the exposure when a standard 18% card is used). For this and all following examples, the RAW has been rendered in 1:1 scale, shots were taken with a Zeiss Makro Planar 100/2 lens set to f/8, the target was in the center of the shot at a distance of 3.5 meters, with the entire shot of the target fitting into a 1000x1000 pixels square. -9.6 EV - in practical terms, it's fallen to zero - only the very large, 100-pixel objects are somewhat visible. There's nothing unexpected here - first the resolution falls gradually, then quickly. In the highlights, the situation is a bit more complicated than it can be supposed, because in vast majority of cases only the linear portion of the characteristic curve of digital image sensor is used in consumer cameras (there are a few exceptions to this rule, like some Panasonic cameras at lowest "actual" ISO setting). 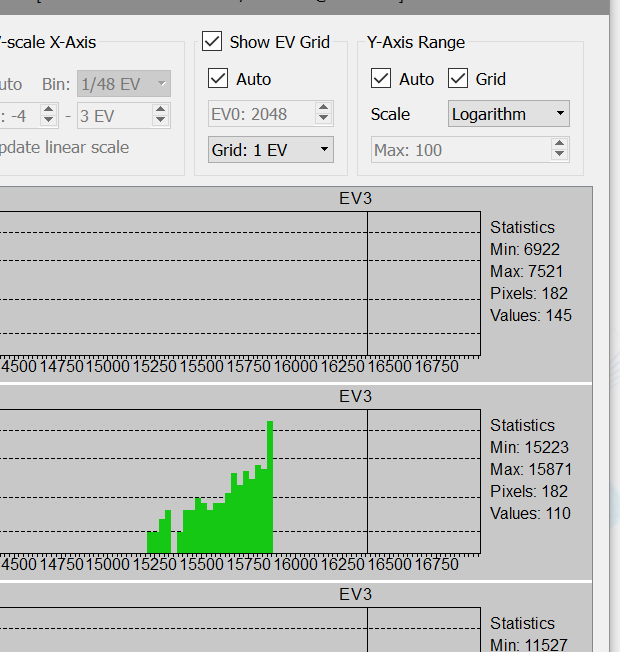 The gray background has become completely white (which is completely predictable, EV = 0 corresponds to a level of gray 3 stops below clipping; accordingly, with +3 EV exposure we get to clipping). However, the darker lines are all in place and the resolution is also there. As we remember, photon flow always has some scatter (photon shot noise, the noise associated with the random arrival of photons on the sensor; "variance equals signal"), as a result the histogram of the single-tone objects is shaped like a bell. On the shot being looked at, the bell on the dark objects is such that its edge has ended up being below the level of clipping. On large objects, this is enough to display them. On smaller ones, there aren't enough pixels, the bell isn't wide enough, it doesn't get past the edge, and there are too few pixels darker than the clipping point to create a visible image. In practice, resolution is evaluated using a semi-automatic computerized method, while the target shots (analogous to the ones shown above) were used for selective verification by eyeballing. The horizontal axis - the exposure of the target, 0 corresponds to "middle gray" (at a level of -3 EV from clipping in the green channel), accordingly everything that's in the positive part (right) is the scene's highlights, everything that's in the negative is shadows. On the vertical axis - the relative resolution, 1.0 is taken as the maximum possible resolution on low ISO. The precision of this vertical axis is around 0.05-0.08 units (5-8% of resolution) or about one small division, so one need not treat these graphs as absolutely precise. 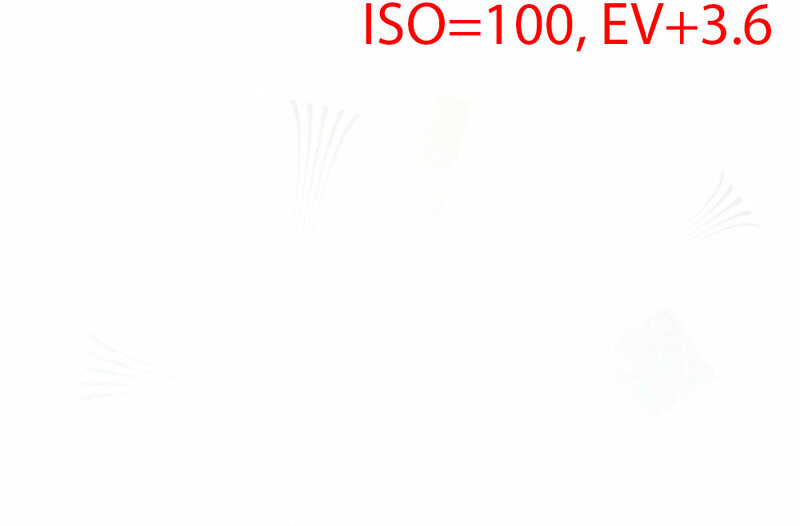 At ISO 100, at the level where "resolution is just a bit higher than zero" we get a dynamic range of 12 (up to 13) EV. Only the real resolution at the boundaries of that range will not be in megapixels, but in kilopixels (see above example at -9.6 and +3.6 EV), some large objects will be somewhat visible over the noise on the background. 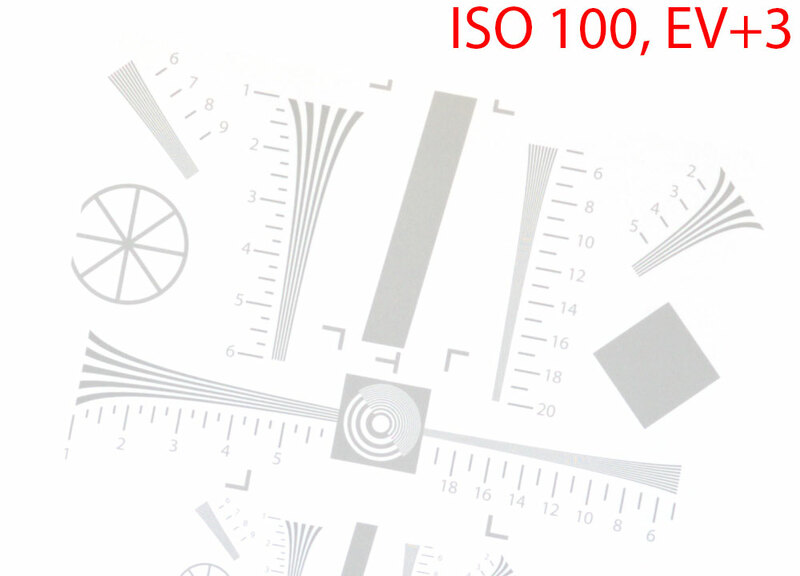 ISO 200 and ISO 100 basically cannot be told apart on this camera, which is completely normal for Canon cameras. If, on low ISO, one underexposes a couple stops (meaning that instead of EV 0, end up at EV -2), and then pull out that exposure in a converter, that will lead to a loss of 10% by linear resolution (meaning that a 30-megapixel camera will become ~24-megapixel). If, instead of ISO 200, one sets ISO 400 and exposes optimally, then this will lead to the exact same effect: a loss of 10% in linear (and ~20% in megapixel) resolution. 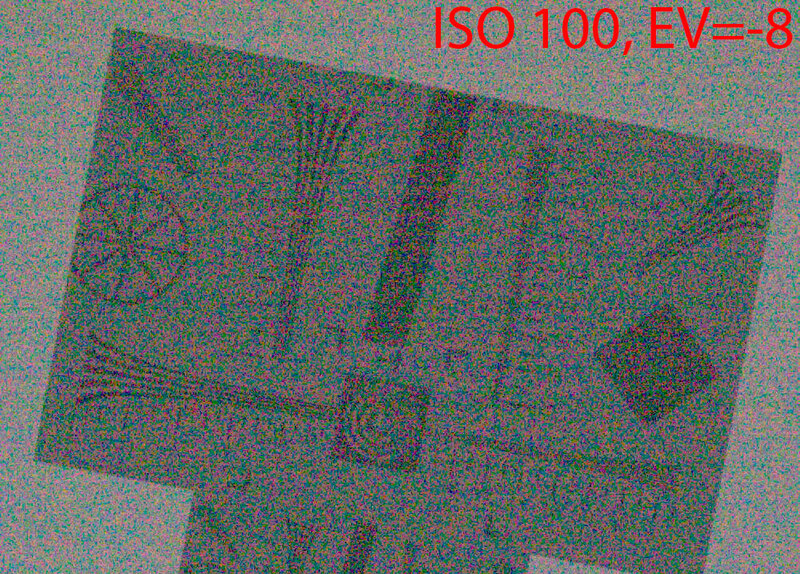 Further increases of ISO speed lead (with correct exposure) to further losses in resolution in the middle gray, and at ISO 6400 we have about a 12-megapixel camera (instead of 30Mpix). One can use the graph in a different manner as well: choose some resolution value which interests us. Let's say 3840 on the long side - this is 0.57 from the (formal) camera resolution. 2.7 EV for ISO 6400, but all of this DR is in the highlights and if we want to use them somehow and get a good shot for a 4K monitor, then we'll need to turn the exposure correction positive (so killing the "room in the highlights"). 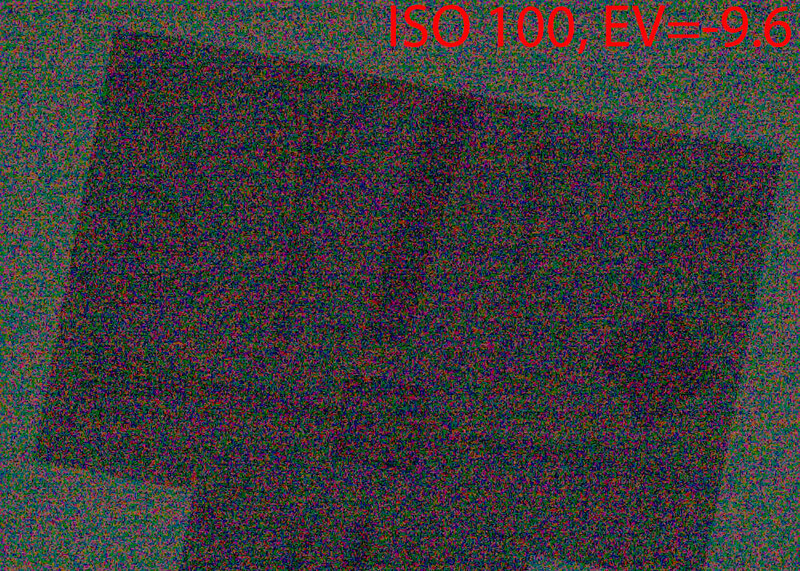 The camera only gives full resolution at ISO 100-400 and in the highlights (this, by the way, explains why ETTR is good). In general, all of this analysis is banal and completely follows from the graphs. We're shooting a dimly-lit scene and want to increase the ISO (and shoot at "optimal diaphragm" since it's optimal). Well, it turns out that it may be much more worth it to not increase the ISO, but rather open up the aperture a bit more than optimal: the losses in resolution due to suboptimal diaphragm may turn out to be lower than the losses due to increased ISO. P.S. The underexposure in these tests was due to increase of the shutter speed, and the data for the extreme left points on the X axis was obtained at very short exposure, down to 1/8000 sec. In real life, the situation will be worse (the noise will be higher, and the DR will be correspondingly lower) due to additional heat noise on real (much longer) exposure. P.P.S. On other cameras, the exact numbers will be different, but the general look of the graphs will remain because the "noise at high ISOs" (at reasonable exposures, less than a second) is the noise from the signal itself (photon shot noise), not the noise from the camera's electronics. Clarity on my photography hobby, from a professional astronomer! I enjoyed reading this - and I am very impressed at your fast raw reader (I program for my CCD & IR detector reading also). You've helped me cut through the advertising hype and see what is happening in reality, with brush strokes that are not so broad as to obscure the detail! I always felt queasy about upping the ISO on the dial - and the images at higher ISO - even starting at 2 stops above the lowest - started to look 'cheap'. I started to wish for on-chip binning (as I have commanded some of my ccd cameras to do - but they are monochrome, no colour micro-paterning, just big Johnson UVBVRZI (or ZJHK for infrared) filters in a wheel.